As I was telling you last week, we (The Cocooners & I) had our Real Housewives of Orange County watch party and made some delicious treats! The recipe that I’m sharing with you today is so yummy and will be my new go to dessert for parties or family gatherings. For this recipe, I used Nutella as the base flavor and although I chose to add raspberry preserves, you could really add any fruit or nut to make a delicious combo! 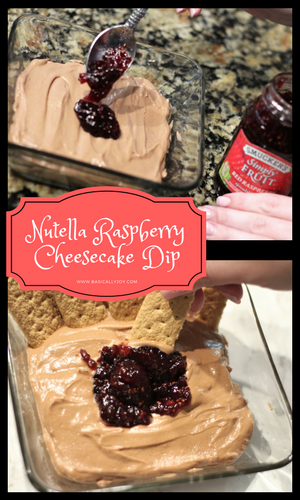 Cheesecake dips are everywhere and now that I’ve made one, I can see why! If you read last week’s post you know that I made a savory dish (Cheddar Bacon Ranch Pull Apart Bread) and a sweet dish, this recipe. I typically gather my inspiration from Pinterest as it is now the Google of the recipe world! 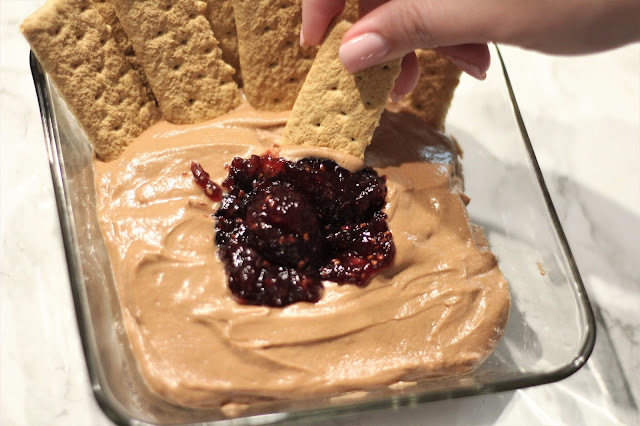 As I scrolled through there were so many variations for cheesecake dips, and I thought it would be something good to try since I have never even made a cheesecake. I didn’t want this recipe to be a cumbersome recipe with lots of ingredients so I tried to keep it as simple as possible. Voila, 4 ingredients plus a topping or mix in and you don’t have to bake or chill anything! This recipe also made a good amount but there still won’t be leftovers (it’s that good!) I don’t want to delay this recipe any longer because my mouth is watering as I type this out, mmmmmm. *Place whipping cream in freezer for approx. 5 minutes to get nice and chilled. 1. Using a hand mixer, begin whipping the cream on medium speed. This should be done for about 7 minutes or until stiff peaks form. If you are new to using whipping cream, this will be when the cream begins to thicken and has more of a “Cool Whip” consistency. Set aside. 2. In a separate bowl, blend the cream cheese and powdered sugar together. You may use the same beaters, no need to clean new ones! Once blended smoothly, add Nutella. 3. Add half of the whipped cream to the Nutella mix and fold together using a spatula. Add remaining whipped cream when first half is blended nicely. 4. This step is optional but I highly suggest it! Add fruit preserves! I used red raspberries but strawberries would be delicious as well. 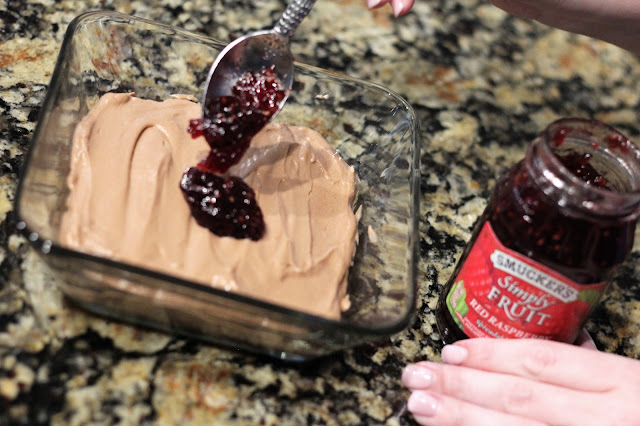 You can either add this as a topping (as shown in pictures) or fold in to mix as done with the whipped cream (we did this after pictures were taken). I used 2/3 cup but add more or less depending on how much flavor you want to come through! 5. 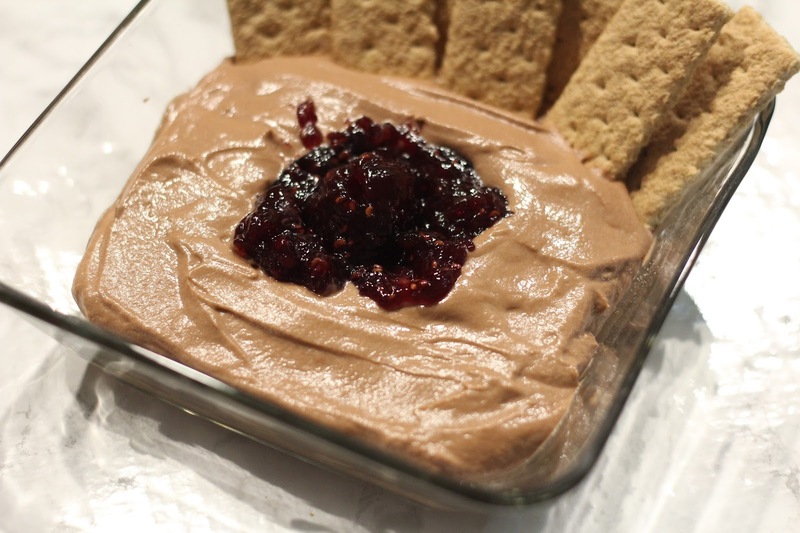 Grab some graham crackers and enjoy now or let it chill in the fridge to enjoy later! As I said previously, I will be making this recipe for so many events this fall! It is quick and easy to put together and can be enjoyed immediately after making or chilled in the fridge to enjoy the next day. I hope this is a recipe you will enjoy as well and if you try a different fruit/topping, let me know! 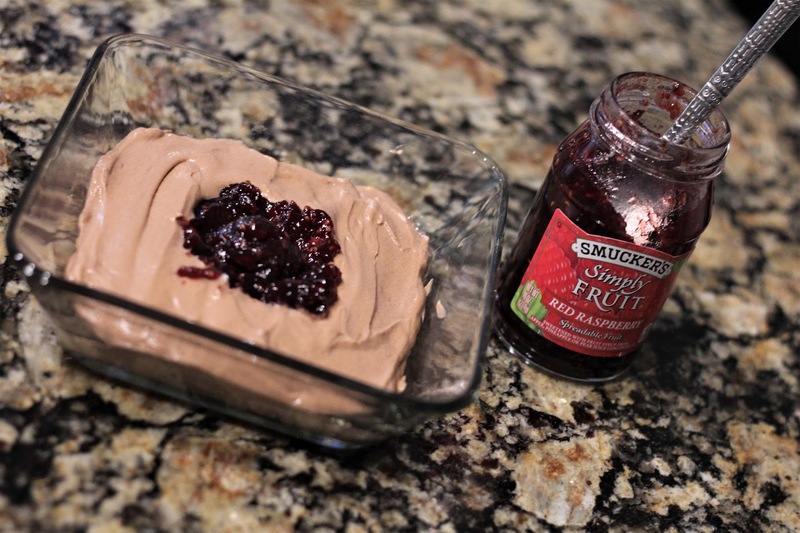 I would love to know what combinations everyone comes up with or if you stuck with just the Nutella Cheesecake Dip. Happy Tuesday & don’t forget public access for the Nordstrom Anniversary sale is this Friday! There is still one day left to enter the gift card giveaway from The Cocooners! See my Nordstrom Newbie post for details! I haven't tried this before! This sounds delicious! Wow you just combined some of my favorites! This is a must try for me! This looks so simple even I could do it. I love every single ingredient. Pinned! The raspberry just takes it over the top. So delicious! I can't wait to have this again. This seriously looks SO beyond incredible!!! I need to try this!! This sounds seriously delicious! I think I could even handle making this too. This looks so yummy! I will have to try this.